Minister of State for National Development Desmond Lee Ti-seng recently claimed that Aljunied-Hougang-Punggol East Town Council, which is run by The Workers' Party, was not transparent. … the financial statements of the Association [i.e., People's Association] do not include the financial statements of the Grassroots Organisations ("GRO") for the financial year ended 31 March 2011. This does not comply with the principles of SB-FRS 27 — Consolidated and Separate Financial Statements that requires the inclusion of all entities controlled by the Association in its financial statements. As at 31 March 2011, there are in total 1,803 GROs not consolidated in the financial statements of the Association. Currently, no audited financial information of the GROs prepared in accordance with SB-FRS are available and hence we do not have sufficient information to assess the financial impact to the financial statements of the Association arising from the non-inclusion of the financial statements of the GROs. In our opinion, because of the significance of the matter referred to in the Basis of Adverse Opinion paragraph above, and its potential impact on the financial statements, the financial statements do not present fairly, in accordance with the provisions of the Act and SB-FRS, the state of affairs of the Association as at 31 March 2011, and the results, changes in equity and cash flows of the Association for the financial year then ended on that date." The financial statements of the Association do not include the financial statements of the GROs for the financial years ended 31 March 2011 and 31 March 2010, and earlier. The Association controls these GROs and in accordance with the principles of SB-FRS 27 — Consolidated and Separate Financial Statements, the financial statements of the Association should include the financial statements of the GROs. There are in total 1,803 GROs not consolidated in the financial statements of the Association as at 31 March 2011 (2010: 1,808). Based on the unaudited management accounts of the GROs, the operating surplus for the financial year ended 31 March 2011 was approximately $12.4 million (2010: $10.3 million), and the total assets and net assets of these GROs as at 31 March 2011 were $229.6 million (2010: $211.1 million) and $215.5 million (2010: $196.0 million) respectively." According to People's Association's auditors, not only were the financial statements of the GROs not consolidated, they were also not audited for many years. Presumably, they were never audited before, because had they been previously audited, why did the auditing the GROs stop? The financial statements for the financial year ended 31 March 2011 were the last to be published on People's Association's website. 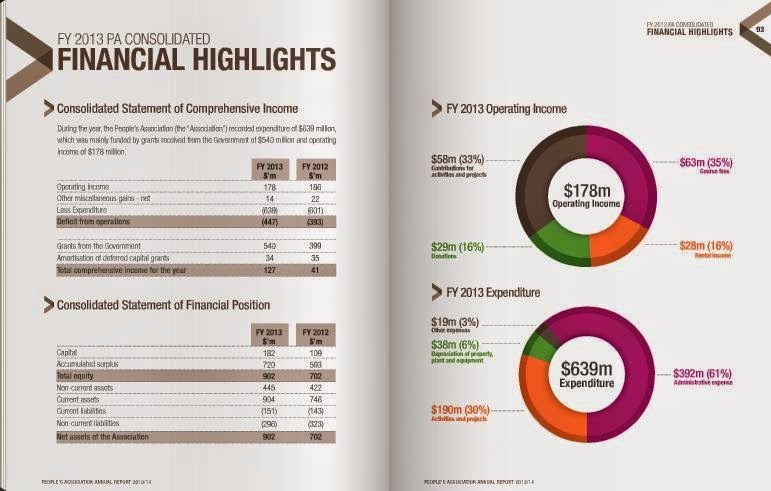 Thereafter, financial highlights, which do not include the auditors' report, were provided instead.